Last year, more CBR 600s were sold in the UK than any other motorcycle. Over the last 10 years, the CBR 600 has, in one form or another, consistently been at or near the top of the sales charts. There is, as you may have realised, a reason for this. If you just want to know why the CBR 600 is such a sales success, skip the rest of this article and just read the last paragraph. Otherwise, bear with me and all will be revealed. Introduced in 1987, the CBR600F has gradually evolved from a jelly-mould misfit to become the benchmark middleweight that it is today. It has an enviable reputation for being easy to get on with, comfortable and practical while still having excellent handling, decent performance and a pretty impressive set of racing credentials. That's a lot to ask, but so far the CBR has proved up to the task. Recently, though, Honda have made some radical changes. Sensing, perhaps, that their middleweight darling was becoming just a little too compromised, they introduced first one and then a second additional model to the lineup. First came the mechanically identical but dynamically slightly more focused CBR600 F Sport, followed this year by the significantly different CRR 600 RR. Both of these will be subject to their own tests, so for now we should content ourselves with simply acknowledging their existence. 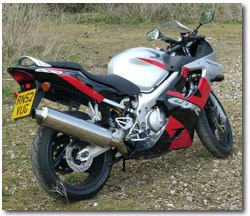 This is the basic, if such a term can be used, CBR600F, complete with centre stand, pillion handles and large squashy saddle. First impressions are, as always, very important, and the 600 doesn't disappoint, despite the rather understated colour scheme of the test bike. The fairing and headlights look purposeful, the forks and brakes look suitably meaty and the proportions are pretty well spot on. From the saddle, too, things look good with a clear instrument panel, nice matt black yokes and a typically well finished look. The only downer, especially on this, the least sports focused of the range, is that the mirrors are only really useful for examining the wildlife which has decided to end it all on your elbows. But I'm getting ahead of myself. Turn the ignition on and watch the display go through a little workout - all the lights come on, the tacho swings round the whole range and back while the speedo counts down from 180. Not quite as cool as a Ducati 999 reminding you what bike you're on, but probably more useful for spotting duff warning lights or LCD segments. 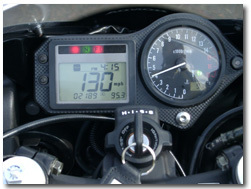 I thought I had one, when I realised that although there obviously is a fuel gauge on the panel, it wasn't showing up. At all. This, I thought, was something odd. Either a massive design error - failing to fit a fuel gauge or light to a bike without a reserve tap - or an electrical gremlin. Neither of these are features one would normally associate with Honda, and of course neither of them are the case here, as I found out a few after setting off with a gallon can bungeed on the pillion seat just in case. Honda have obviously noted criticisms of other bikes where the fuel warning is rather more discreet than might be considered sensible, and have made it as obvious as it can possibly be. The fuel gauge only comes on when you hit reserve. You can't miss it - it takes up the entire left side of the LCD panel - and it counts down, in blocks, the amount of reserve fuel you have left. Very effective, very Honda. And something I suspect we'll see a lot more of, because it works. Anyway, before you start to run out of fuel you'll probably want to have done some riding. Start the engine and let it warm up while you do up your gloves and helmet. By then it should be ticking over at something approaching a normal speed, rather than the rather frantic idle it starts off at. Pulling away is completely without drama, although if you're used to something with lots of torque then you may be surprised at the amount of revs you need. At low speed the CBR is totally composed. The suspension is compliant enough to sort out all but the worst of the potholes and speed bumps around town, while the soft seat handles the rest. The low centre of gravity and light controls make town riding a doddle and the narrow mirrors are fine for filtering although, as said before, damn-all use for seeing behind you. The riding position is upright enough not to provoke numb wrists while still being comfortably sporty. Moulded-in bungee hooks allow you to easily strap a reasonable sized bag on the back as well, and there's just about enough room under the seat for waterproofs and a disc lock. 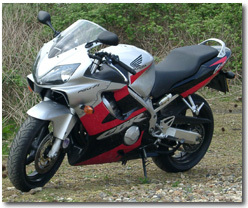 So you can commute on the CBR 600 quite readily. Once outside the confines of the urban environment, the CBR shows a slightly different part of its character. Getting out into unrestricted areas and allowing the bike to stretch its legs a little demonstrates that, despite being only 600cc the CBR is perfectly capable of covering large amounts of ground at a very respectable (or disreputable, depending on your viewpoint) pace. The lack of torque does mean that you'll be dancing on the gearshift a fair amount, and there is an occasional high frequency buzz through the handlebars which can be a little unpleasant. But even with pillion and saddlebags the CBR 600 allows you to cover around 150 miles before a combination of increasingly insistent fuel warnings and mild paranoia that something is happening behind that you've missed force a stop. It's certainly fair to say that the CBR 600 makes a perfectly adequate sports tourer. Outside town and freed of the responsibility of a pillion, the CBR becomes different again. Making use of the whole rev range that dance on the gearshift has changed from a waltz to a quickstep. Controls which were light in town and simply convenient while riding normally are now razor sharp, the bike tracking perfectly from apex to apex, the suspension giving enough feedback to be useful while not threatening the rider with information overload. The brakes have loads of feel and plenty of power and the riding position lends itself perfectly to moving around as much or as little as you want while stealing the occasional glance over the shoulder to see if you've attracted any unwelcome attention. You're unlikely to - the CBR, even at full chat, is as quiet and unobtrusive as you could reasonably ask. I'd say that the CBR 600 makes a very fine sportsbike. Looking at the tyres and suspension convinced me, had I needed it, that the CBR 600 would probably not be a very good offroader, although I have no doubt that it would have given it a shot and may well have been better at it than I am. But that's the only area in which I have any reason to doubt the capability of the little Honda. This is probably as good a place as any to admit that I had an innate, irrational and implacable dislike of the CBR 600. Its ubiquitousness, its all round ability and its user friendliness all conspired to make, in my eyes, a very dull motorcycle. Its probably also a good time to point out that so far, out of the two Hondas I've reviewed here and about which I have voiced preconceived objections, both of them have succeeded in overcoming them. The CBR is a very good motorbike. It goes and handles far too well to be called dull, and I can honestly say that for the less experienced rider there are few better ways of learning the craft. In the hands of a more proficient rider the CBR would be capable of taking more than a few scalps at a trackday, while still being flexible enough to ride to (and hopefully from) the circuit. I didn't fall in love with it and I won't be trading in for one any time soon, but I can't help admitting a grudging respect. It's just too good not to. 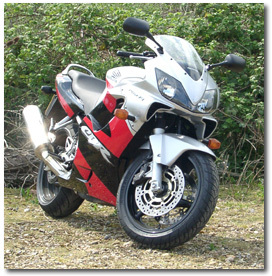 Why is the CBR 600 so popular? Easy - because 99% of the time it will do absolutely everything you could possibly ask, better than you can imagine, and totally without fuss or drama. Now that may sound a little unexciting, and perhaps if you're a really dedicated sports rider, long distance tourer or desert raider then the little CBR may be just too much of an all-rounder for you. But for the rest of us ordinary humans there is something very comforting about being able to call on overwhelming competence. Liquid cooled 599cc four cylinder 16 valve four-stroke. 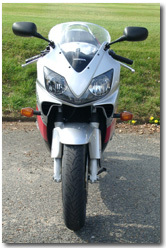 Read external Honda CBR600F reviews on ciao.